Charles Olson, rpjkw11, xxLCxx and 2 others like this. Im still sceptical about 12 cores or 16 cores/32 threads for mainstream users. Would prefer them to focus on improving 8c parts, higher clocks around 5ghz, better ipc and 3600mhz ram support. MaitieS, rpjkw11, xxLCxx and 2 others like this. 12 or 16 cores is all very well and good. But what Ryzen really needs is a decent IPC and/or a clock speed increase if it wants to really stomp on Intel. As it stands I’m happier to pay more per core for Intel because of Intel’s significant clock speed advantage couple with its modest IPC advantage. 144hzGamer and BSim500 like this. It goes hand in hand, because AMD appear to be building a fast 8 core chiplet and then daisy chaining from there to create higher core counts. Bolting bits and pieces of a CPU together. This is how AMD are competing financially against Intel. Instead of designing enormous complex fixed monolithic parts that cost a fortune to fabricate, AMD are separating parts of their processors and designing clever ways to link them together with (hopefully) minimal performance loss. You can scale core counts easily up or down, to fit any conceivable market segment. They have now even separated their I/O, so they can potentially bolt on different controllers to scale PCIe lanes for example according to segment. It appears the I/O of Zen 2 may even be built on an older cheaper process, to further reduce costs! While monolithic chips will likely be advantageous for ultimate performance, the future advancement of the industry as shrinking chips become increasingly difficult is going to rely on chiplet designs. AMD saw it before Intel. Intel now acknowledge this also and are heading to this direction. To that end AMD can get fantastic yields, have very low costs and give away only a small order of performance percentage to a monolithic part, a part potentially costing twice as much to build. rpjkw11, NightAntilli, Skeptron and 4 others like this. I hope someone looks at my post in a few years from now and I bet once the new GEN gaming console are in the market they are promised RYZEN CPU's with 8 cores so expect AMD hardware to be tweaked and take advantage of AMD's new CPU's. This explains why AMD's 7790 GPU card (which I owned) has stayed very strong within the years since during that time old game consoles had a similar chip that was used. Flood the gaming market with AMD products and it will pay off sooner or later. Or maybe I'm wrong? Very well said!!!!!!!!!! Also what's great is that AMD is strong from living on pennies during their hard times. If AMD conitunes to make cheap high performance hardware sooner or later INTEL has to cave in and re adjust their pricing but stock holders will be mad and INTEL's CEO's are not going to like the low profit numbers so it will slowly eat INTEL. If INTEL stay's stubborn and KEEPS it's pricing expensive that means AMD can charge a little more but will end up making MORE profit since INTEL leaves AMD a large gap to charge more for their products. It's a win/win! You are misunderstanding something here. Having 12 and 16 cores doesn't mean that they are cutting corners on the 8 core parts. Their core complexes (chiplets) have 8 CPU cores, it's just that they made it so that they can use multiple core complexes. In fact the changes they made to infinity fabric and their I/O chip helps improve 8 cores a lot. AKA you get the cake and you can eat it too. You get more cores, better single core performance and better memory support (hopefully on this last one). Besides, it's the server market where AMD needs to focus, not mainstream. That's where they'll get the serious R&D money they need. Zen 2 is going to have 10-20% higher IPC, and there will be multiple models at 5GHz. Why do you care if there are also 16 core models? They already increased IPC and demonstrated a engineering sample 8c beating a 9900k...they're just getting the tech to work at 12 & 16c now..they could release the 8c Zen 2 tomorrow and take the performance crown from Intel with no issues...by June/July, they will likely have everything working to their expected specs. They are well ahead of their expected sales in the server market...and Zen 2 will give data centers 64c/128t 2u server blades...that's unheard of power with a small rack footprint...if they release dual socket boards, forget about it. CaptainTom and Puiu like this. I have a different perspective because I use a lot of multithreaded workloads instead of single threads. They are definitely trying to steal the low end side of Intel's server market. Meh, Cinebench doesn't tell me much. I want real world benchmarks and they should show the clocks used aswell. That CES comparasion is just hype feeder. There is no contradiction between having a 12 core cpu and a close to 5 GHZ clock speed. This is NOT a monolithic die and these chiplet can reach 5 GHZ with the 7nm process of TSMC. Unfortunately for Intel they will not be able to compete against Zen2 Ryzen and Epyc even with their 10nm process if it ever comes later in 2019 or early 2020. Not only are Intels yields poor, but their costs per wafer are way above that for AMD/TSMC. INTEL will not compete successfully on cost of their ICE Lake products. There is.no sign Intel has moved away from their obsolete monolithic die designs. It will be a very promising 2019 and 2020 for AMD. 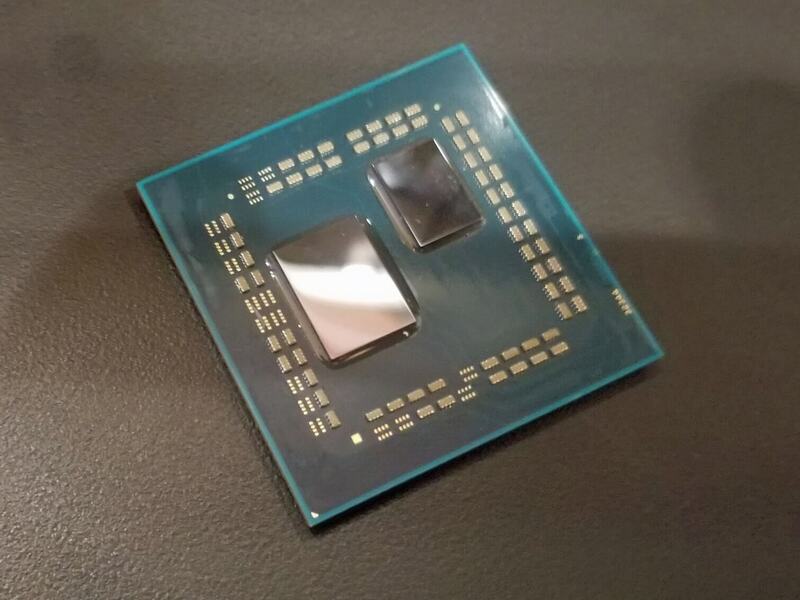 Already the IPC is better on the engineering samples than on the 9900k. At CES the cinebench competition was run at the same 4GHZ clock speeds. Ryzen 3000 slightly beat the Intel chip. So that proves Ryzen 3000 IPC is already slightly ahead of Intel already and will further surpass Intel as tweaks occur in the next 2 months before the chip goes into production. I wouldn't count out Intel just yet. They are going to suffer some serious challenges in the server space over the next 2 years for sure. That will mean a lot of money headed AMD's way. For consumer parts it is easy for people to forget AMD were demoing a Zen 2 part on AMD's favoured benchmark. It just about scraped past a 9900k, but that is built on a previous generation process. AMD might have finally caught and even slightly surpassed Intel in ultimate performance, however they needed a considerably superior, brand new node to manage it. A node Intel will (finally) exploit in 2019. Desktop 10nm parts are likely at least 6 months behind Zen 2 at this point but I expect Intel will have made significant IPC gains. That is what they were hinting at when revealing their Sunny cove core design last month, including road maps, which hasn't been Intel's thing for a few years. Public road maps mean they now have confidence about future products, unlike the past. AMD will gain a lot of new customers this year, it is hard not to when Intel dominated the scene for so long. Intel are still a long way from death. A looooong way. We are simply seeing the fruits of increased competition so 2019 will be a great year for CPUs! Intel 10nm cannot compete against AMD 7nm on an attractive price point. Intel 10nm has poor yields and is a far more expensive process. Intel is unwilling to compete on price and developing a CPU that can only surpass AMD by 5 or 6 percent at $200 to $300 more is going to alienate customers and corporate clients. Intel is not dead but will be in a declining state over the next 3 to 4 years at least. You can't possibly know details of Intel's 10nm process, since it's not complete yet! We will finally see it with Ice Lake and can assess it then. It has been respun, failed with Cannon Lake, and redesigned again in the past year so whatever Intel cook up for Ice Lake will determine what they actually have on their hands. When Intel revealed details of Sunny Cove last month it certainly impressed upon me that there will be significant architecture changes and potentially a notable increase in single threaded IPC. The whole front end has been widened and Intel are still well ahead with introducing better instructions. Chances are they will regain the consumer platform lead when it arrives, and will do what they usually do. Charge a premium for it. Which a lot of people will pay, just as they have done the past few years despite Zen being on the scene. Until Sunny Cove launches Intel is going to have trouble competing at mainstream level. AMD will most likely have gen 4, the Zen 2 refresh, out before Intel can start sampling. I don't know why but I have a feeling that Intel will skip 10nm for their major redesign and move to 7nm (not the same one as AMD, but their own version) with Sunny Cove. Nothing about 10nm says to me that it will ever be ready to replace 14nm with how much trouble Intel has keeping stocks up even on a very mature process. AMD at least tries to mitigate the yield issues for a new process using chiplets to lower the size and complexity and keeping the I/O chip on 14nm. They are trying to steal the entire market at this point. They demoed a single Epyc 3000 defeating TWO of Intel's top Xeon's while using less energy than one. That means 2-cpu EPYC rack will defeat a 4-cpu rack from Intel... And AMD is also talking about possible 4-cpu racks as well. I wouldn't count out Intel just yet. It is easy for people to forget AMD were demoing a Zen 2 part on AMD's favoured benchmark. It just about scraped past a 9900k, but that is built on a previous generation process. AMD might have finally caught and even slightly surpassed Intel in ultimate performance, however they needed a considerably superior, brand new node to manage it. A node Intel will (finally) exploit in 2019. Desktop 10nm parts are likely at least 6 months behind Zen 2 at this point but I expect Intel will have made significant IPC gains. AMD demoed an underclocked R5 3600 matching a 9900K. That's a ~$250 CPU beating Intel's $500 flagship! We aren't talking about AMD edging past Intel, we are talking about AMD's low-end destroying Intel's Halo products. This is about to get so much worse for Intel than I think most realize. Just remember that Sunny Cove is 2016 architecture and Intel's 10nm is 2016 manufacturing process. Sunny Lake architecture changes can be hardly called "significant". It's just tweaked Skylake. Changes from Ivy Bridge to Haswell or Haswell to Skylake were on same league than changes from Skylake to Sunny Cove. Changes also reminds me of Haswell. 33% more ALU's from Ivy Bridge ALU's equal 33% more performance, eh, no? Also, where is Sunny Cove exactly being positioned? Wider core probably means less clock speed and since L1 cache should be 12 way associative, it's going to be quite power hungry one. Sunny Cove was thought to be released on 10nm+ process somewhere around 2017 when Intel would have manufacturing and architecture leadership (Ryzen was supposed to be somewhere around Ivy Bridge). In that case shortcomings like less clocks and more power wouldn't be any problem. That didn't happen. Next year Intel tries to compete against equally strong IPC architecture (Zen2) with one that consumes more power and clocks poorly. Combine that with 10nm tech that works like crap and is not even better than TSMC 7nm AMD has. So it's very hard to see Intel is going to regain consumer platform lead. They might have slightly better IPC but AMD clocks better, have lower power consumption and have better manufacturing tech. On the amateur side, it's a good time to be building your own PC. AMD's products are competitive on price and performance. Plus, competition is always good for the marketplace. It pushes (or should push) Intel to improve its products. The same is true on the graphics side with its Radeon RX and Vega cards, as well as the upcoming Radon VII. That last product hasn't been released, and many are disappointed by the perceived performance vs. price. Independent testing will confirm whether the concerns are valid. My belief is simple: Intel and Nvidia offer the best performance that money can buy. AMD offers the best value. What you do with your money is up to you. Either option is fine. And that's why competition is great for us consumers. Sausagemeat and Peter Farkas like this. I mean your belief is wrong. Ryzen currently wipes the floor with Intel at all levels besides some edge cases. You basically have to try to make Intel look good to give them any wins these days.